Gwangju is a central city in the southwestern part of Korea, you can reach any other place in South Korea within a day. Gwangju is located between a mountainous area to the east and a plain area to the west. The city is surrounded by several famous mountains; guardian hill on Mt. Mudeung, Jangwon Summit, Mt. Yangrim, and Mt. Seong-geo. The west part of the city has low hills and fertile pains. The river of Gwangju-cheon runs downtown into the city, joins Geukrak River and Seokgok Cheon River at the estern border of the city, and flows into the Yeongsan River. Mt. Mudeung, the spirit of Gwangju and a symbol for the southern region of Korea. Mt. Mudeung ranges from the east side of Gwangju to three other districts of Nam-myeon, Hwasun-gun, and Iseo-myeon. 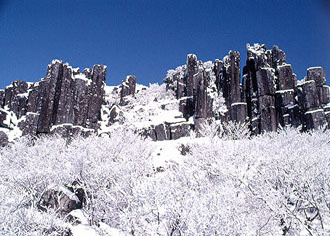 It is one of the highest mountains in the Jeollanamdo province with an top altitude of 1187m. Mt. Mudeung is covered with azalea blossoms in spring, colorful leaves and eulalias in autumn, and snow in winter. There are a number of temples with interesting legends and cultural properties at the foot of the mountain. Gwangju is also known for it's civilian uprise in May 1980. A large number of Gwangju's citizens protested against the military regime in order to defend justice, democracy, human rights and freedom.